I love Easter but I miss my daughter and granddaughter being little. Seems like it’s just more fun. Here are some fun ideas we used to do. 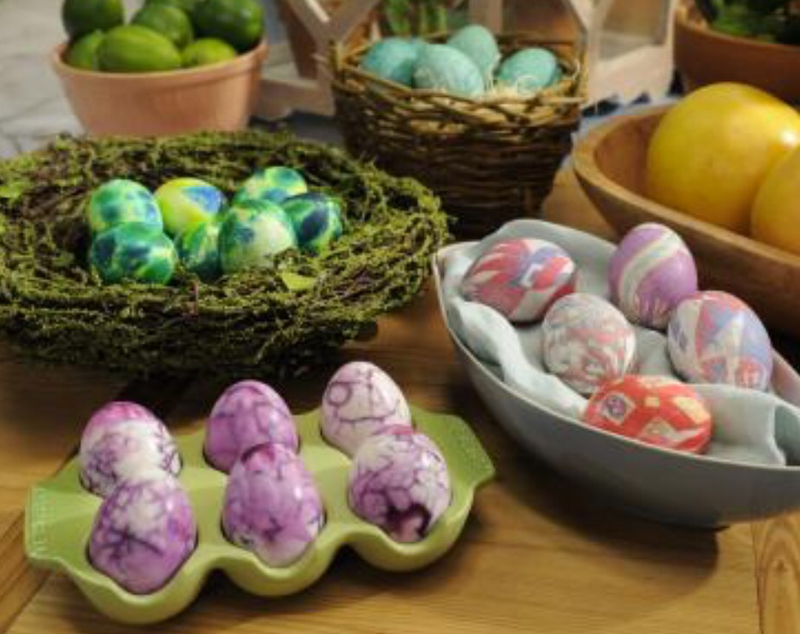 Dye your hard-boiled eggs with a light base coat in the color of your choice. Wet a patterned or quilted paper towel with white vinegar. Wrap the wet paper towel around a hard-boiled egg and twist to enclose the egg snugly in the paper towel. Dab dots of different shades of food coloring in various spots on the paper towel. You can let it sit for 1 to 2 minutes, although it’s not necessary. Then, remove the paper towel to reveal the pattern! Repeat with the rest of the eggs. Place white, uncooked rice in a plastic container with a lid. Add about 6 drops of your desired shade of food coloring and shake up the rice until it’s uniformly colored. Add a hard-boiled egg and put the top on the container. Gently shake the egg around until a speckled pattern emerges. Repeat with additional eggs. You can do 1 color, or mix it up with different colors in different containers. Just toss the eggs consecutively in each container. Hard-boil your eggs, then let them cool. Crack the eggs all over using a tabletop or the back of a spoon; don’t break the shells off, just crack the outer layer enough to create a crackle pattern. 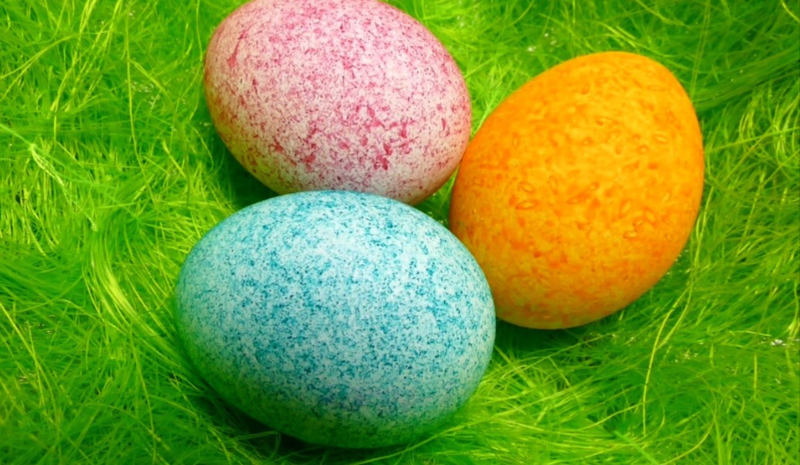 Place each egg inside a ziptop bag (1 egg per bag), then place a few drops of food coloring and 1 to 2 tablespoons of water in each bag. Twist the bags around the eggs and secure with a rubber band. Let sit for about 30 minutes, then take the eggs out of the bags and carefully peel the shells from them, revealing the crackle patterns. Use an old tie that is 100 percent silk or buy one at a thrift store. Cut off pieces of the tie large enough to wrap completely around an egg. Then, cut similar-sized pieces of fabric from an old sheet or pillow case. 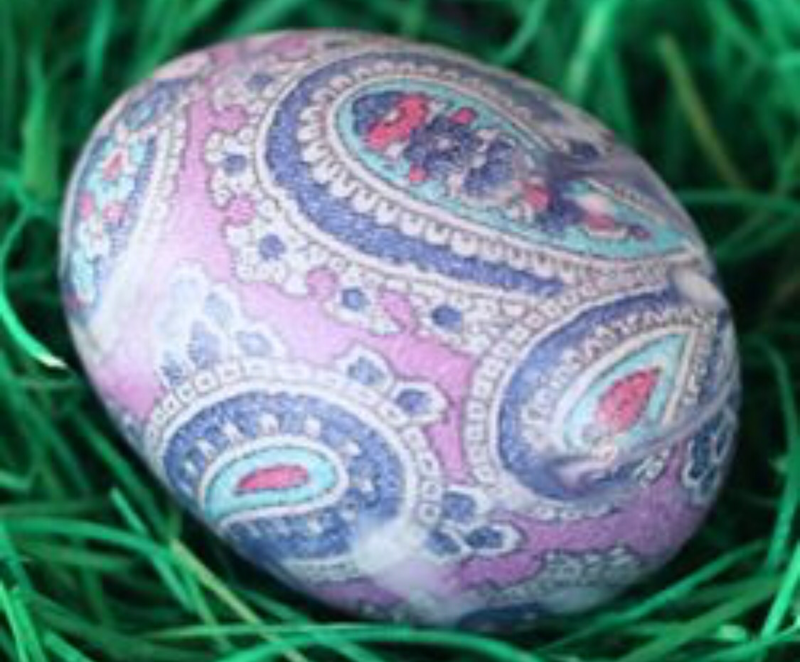 Wrap each uncooked egg in a piece of the tie fabric with the pattern facing the egg and secure with rubber bands, then wrap in a piece of the fabric and secure again. Place the wrapped eggs in a glass or enamel pot filled with enough water to cover the eggs and add 3 tablespoons of white vinegar. Bring the water to a boil, then reduce the heat and let simmer for 20 minutes. Remove the eggs from the water, let cool for 30 minutes and then unwrap to see the tie’s designs transferred onto the eggs! 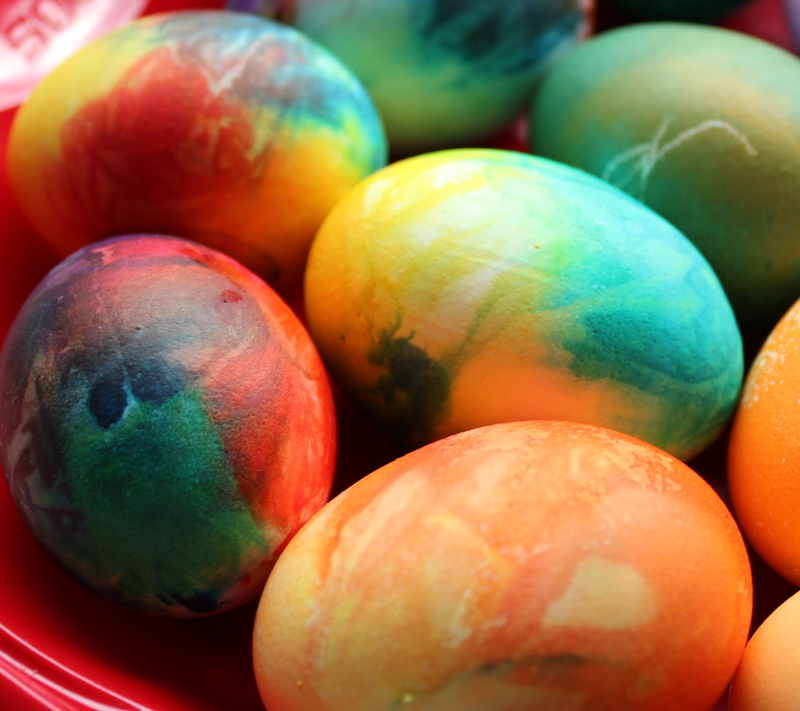 Use these tie-dye eggs for decoration only; they are not intended for consumption. Very pretty eggs. I miss decorating eggs with my kids too.